If the current trend continues, next year King County will send more people to California than the Golden State sends here. Here’s a switch: Pretty soon, it might be Californians who get to complain about all the folks from Seattle who keep moving down there. According to new census data — which are current to 2013 — about 14,700 people from King County move to California per year, on average. That ranks King third among all U.S. counties for the annual number of emigrants it sends to the Golden State. The only counties that top us are both in states neighboring California: Maricopa (Phoenix, Ariz.) and Clark (Las Vegas, Nev.). 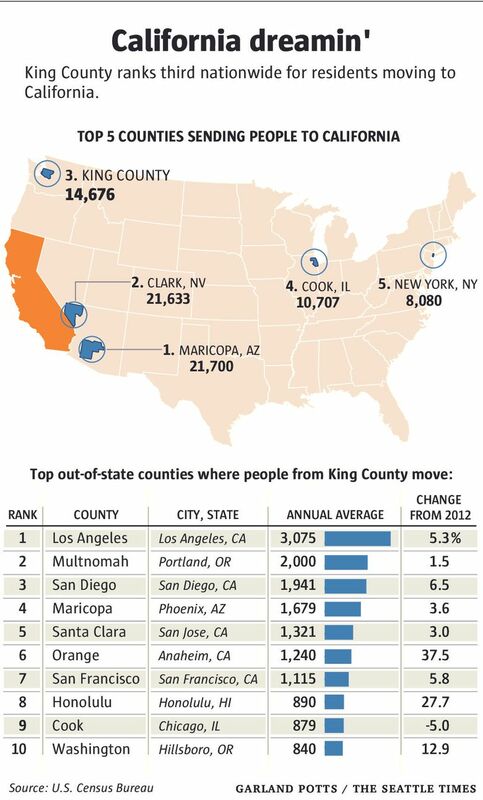 In fact, King County alone sends more people packing to California each year than 40 U.S. states. About 56,000 people leave King County for another state each year, and more than one in four of them choose California. The data also show a sharp uptick in the number of folks trading in Seattle gloom for California’s endless summer (and drought) — about 1,000 more movers than in last year’s data. In contrast, the number of Californians moving here barely budged. It now stands at about 15,400 — a tiny bump of around 100 people since last year. California is still sending about 700 more people our way than we’re sending them, but that difference has been whittled down to less than half of what it was last year. And if the trend continues, next year’s data will hit a milestone: More King County residents will be moving to California than the reverse. Los Angeles County takes in more than 3,000 King County émigrés each year, which is more than any county in California — or for that matter, in the U.S. But Orange and Sacramento counties experienced the biggest jump last year, and even the ultra-pricey Bay Area counties saw increases. I guess Seattle real estate just isn’t expensive enough for some folks? While California immigration to the Seattle area may have slowed in the new data, the Golden State remains the No. 1 feeder of new residents to King County. 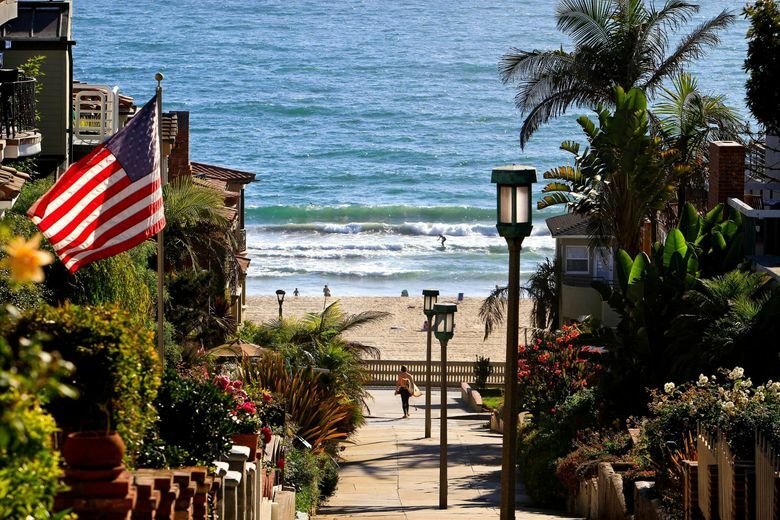 Californians represent one quarter of all people who move here from out-of-state. And there’s a big gulf between California and all the other states. Oregon, which ranks second, exports only 4,779 people to King County in a year — about one-third of the number from California. In fact, the only place that approaches California’s exports to King County is an entire continent: About 13,600 people moved here from Asia.